- Luis Diaz (pictured) started in the Double-A game, showing off a four-pitch arsenal, but the whole package was very pedestrian. Diaz has a soft body, but it is a starter’s build and he has filled out considerably since he entered the system. Diaz started the game throwing over the top, but as he got deeper into the outing, you could see his arm slot dropping down a tick. Unsurprisingly, his fastball, which sat 91-93 mph in the first two innings, dropped in velocity so that by the fourth he was more 89-91 with the majority of offerings in the lower end. He recorded his only strikeout of the outing on well-located 91-mph fastball down in the zone, but for the most part his command was not crisp. The pitch is very straight and he was not consistently finishing his delivery, resulting in him leaving the pitch up in the zone. Diaz mixed in three secondary offerings, a changeup and two variations of a breaking ball. He threw his changeup 77-79 mph, showing occasional late vertical drop, but the pitch for the most part was firm and straight. Both of Diaz’s breaking balls had the tendency to roll to the plate. His slider flashed some potential, but it seemed like he got caught in between the two at times, throwing a slurve-like offering that hung in the zone. Diaz only gave up three hits in four innings, though he got away with a few pitches that higher-quality hitters would have handled. Diaz also was helped out by Blake Swihart, who threw out two runners attempting to steal, showing off a quick release and easy plus arm. - Each year during Spring Training, a new international signee at shortstop seems to stand out with an advanced defensive skill set. This year’s version was Javy Guerra, a July 2012 signing out of Panama. Guerra already has a bigger frame than other shortstop prospects in the system, such as Jose Vinicio and Raymel Flores, and his frame looks like it could hold additional size, unlike those two. Presently, however, he is still skinny and lacks strength, which limits him at the plate. In the field, he was very impressive, showing off a quick release and plus arm, combined with soft hands and fluid actions. He exerted confidence at the position and seemed comfortable both charging the ball and moving laterally to field it. At the plate, Guerra has a slightly crouched stance. His hands work and he has good bat control, but his swing is upper-body heavy, as he does a poor job of incorporating his lower half into his swing. There is little-to-no power there now, both because his swing is tailored more to line drives and because of his lack of physical development. Regardless, Guerra will be one of the more interesting names to follow once the season starts. 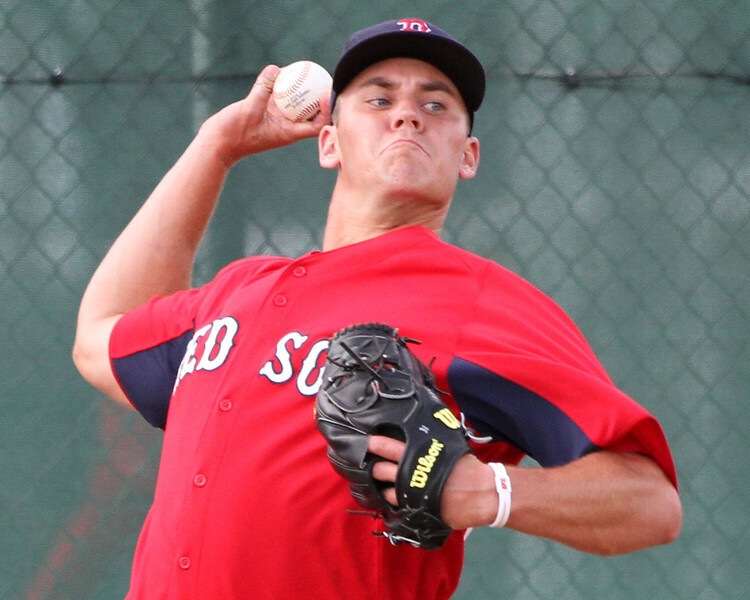 - When Madison Younginer (pictured) entered the system, it was clear his delivery needed work, as he had an exaggerated point-and-stab movement with his arm as it came behind his body. Over the last few years his delivery has improved greatly, to the point where it looks like he has finally found some consistency with it and locked in his release point. The stab behind his body is less pronounced and he consistently repeats an over-the-top delivery. Pitching exclusively from the set, Younginer worked 93-95 mph, though reports from the Fall Instructional League had him touching higher than that. He struggled with his command, as he was not finishing his delivery, resulting in the pitch being elevated in the zone. When left up, his fastball is straight and very hittable, giving hitters a good look at it. Younginer mixed in a 12-6 curveball that showed short, hard break, but it was inconsistent. Working out the kinks is part of Spring Training, thus his lack of crispness is not something to worry about. If Younginer can carry over how he pitched in the second half of last season into the regular season, he could put himself back on the prospect map in 2014. - Jose Vinicio has been playing with the Double-A team in camp (note: not a sign that he will start in Double-A) and has at times looked overmatched, but not as much as one would expect for someone who struggled at the plate as much as he did last year in Greenville. Vincio looks a bit more physically mature than last season, but he still is extremely slight of frame and it does not look like there is much projection left in his body. His defensive tools are still solid, with plenty of arm and a glove that will easily play at the position. At the plate, he showed off better bat control than past looks, best exemplified in the first inning on a hit and run when batting right-handed, he pulled his hands inside a tough fastball and inside-outed it to right-center field for a double. Vinicio could have easily been jammed and rolled the pitch over, but he did an excellent job staying inside the baseball and had enough strength to muscle it into the outfield. However, he still is very inconsistent from at-bat to at-bat, showing poor pitch recognition skills at times and a tendency for his swing to get long, resulting in him coming around the baseball.